The New Mexico State University Foundation selected NMSU student Valerie Devereaux to receive one of this year's Scholarships. Valerie is originally from upstate New York, but grew up in Las Cruces, New Mexico. According to Valerie, "My entire life, I’ve been drawn towards art and creative ventures. I draw or work with metal almost daily in efforts to make sense of my life and the world around me. In this way, art became a meditation practice. Through art, I discovered my passion—creation. Nothing in life gives me more satisfaction than creating artwork: primarily drawing and metalsmithing." The University of New Mexico Foundation selected UNM student Annie Jaynes to receive another of this year's NMC Scholarships. Annie is originally from Alabama, but moved to NM due to her family’s involvement in the movie industry. Her exposure to this led to a strong passion for working in film, driving her to enroll in UNM’s Interdisciplinary Film and Digital Media program. Since joining, Annie was awarded “Best Screenwriting” and “Best Directing” for the NM Student Filmmaker’s Showcase in 2016. She is currently writing and directing a film for her senior year. After graduating in 2018, she hopes to continue her career in Los Angeles. Aside from film, she enjoys backpacking and video games. The Institute of American Indian Arts (IAIA) Foundation selected Rachelle B. Pablo as one of this year's NMC Scholarship recipients. Rachelle was born in 1971 in Gallup NM. 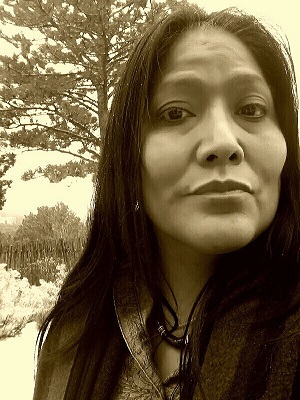 Her mother, Marilyn Taliman (dec.), was an educator on the Navajo-Dine’ reservation; her father, Roger Pablo Sr. is a former addiction counselor, retired coal miner, and horse enthusiast. There are two profound influences in Pablo’s art: her grandmother, Mary Roanhorse Brown, a traditional Diné sheepherder and weaver, and the intertwined relations of Indigenous and Chicano Southwest culture. Her artistic expression is conveyed by her euphoric interwoven connection through charcoal, inks, paint, and metal. She is currently pursuing her BFA in Studio Arts, shifting her emphasis from painting to 3D metal sculpture. Rachelle earned her AA degrees in Anthropology and Liberal Arts in 2012 from Central New Mexico Community College in Albuquerque NM; completed the four-year Joint Apprentice Training Program in 2007 from Sheet Metal Workers Local Union 49 in Albuquerque NM; and earned a Certificate of Completion within the U.S. Army Intelligence Center School as a Signals Intelligence Analyst at Ft. Huachuca AZ in 1998. The Northern New Mexico College Foundation, on behalf of Northern New Mexico College, selected Taishanna Sanchez to receive one of this year's NMC Scholarships. Tai, as she prefers to be called, was born in Santa Fe and raised in Chimayo by her great-grandmother, who she says has always been there for her. She is a graduate of Espanola High School and is the first member of her family to attend college. She started drawing at four years of age, when her Grandma gave her a coloring book to keep her occupied wherever she took her. Tai says, "Drawing made me happy when I was sad, it felt like the crayons were a switch that turned on my bright side."